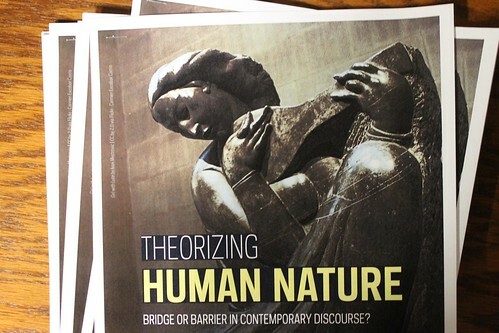 In anticipation of their upcoming graduate conference, "Theorizing Human Nature: Bridge or Barrier in Contemporary Discourse," the organizers answer a few informational questions about it below. Organized by Notre Dame graduate students Liam de los Reyes, Carl Friesen, Jimmy Haring, and Kara Shields, the conference will take place on February 25-27 and will including participants from both the University of Notre Dame and the University of Chicago Divinity School. 1. First of all, can you tell us a little about the genesis of the conference? Why did you decide to organize a conference on the topic of human nature, and what's the significance of the conference title? The topic of human nature is a perennial one, but came under increasing suspicion in the modern period. However, it has been revived in various forms in recent work in philosophy, theology, and other disciplines (and it never disappeared entirely). Because there are philosophical, social, and biological aspects of "human nature," it seems that this concept has potential to serve as a discursive bridge between the humanities, social sciences, and natural sciences. However, there is also reason to worry that the concept is merely a way of "naturalizing" power structures that should be critiqued and dismantled. So it is unclear whether the concept can in fact serve as a bridge between discourses, or whether it is ultimately a barrier to fruitful dialogue between disciplines and progress on contemporary moral concerns. 2. There will be four eminent keynote speakers at the conference. Can you say a little about their work on human nature? Vincent Lloyd is a leading figure in the redevelopment of a justice-minded political theology which incorporates new voices and issues into the examination and critique of movements, figures, and schools of thought on the religious meanings and sources of political action and thought. Lloyd’s work on black religion and black secularism is particularly of interest given that natural law and human nature in the theological canon are often presumptively universal, uncritically white narrative concepts. Cristina Traina’s interdisciplinary approach to moral theology has played an indispensable role in challenging and reshaping theological reflections on human nature. A cautious and dynamic, but nonetheless substantive, account of human nature figures prominently in her prolific work on feminism and natural law, ecology, economics and immigration, bioethics, sexuality and reproduction, and more recently, the ethics of child agency. In addition to historical and documentary examinations of religion and Asian religions in the U.S., Thomas Tweed has engaged the question of the human dimensions of religion from both ethnographic (Our Lady of the Exile: Diasporic Religion at a Cuban Catholic Shrine in Miami) and theoretical (Crossing and Dwelling: A Theory of Religion) standpoints. Of special interest in the latter book is the way in which Professor Tweed incorporates human biology as a substantive but non-reductive component of understanding religious phenomena. Severin Deneulin brings Catholic social teaching into conversation with international relations as well as the theoretical approach of Amartya Sen. In particular, she has drawn attention to the occlusion of religion in development theory and ethics and has sought to reintegrate religious needs and beliefs into a common good framework for development in a pluralist world. 3. Finally, can you give us a sense of some of the issues that will be addressed during the panel discussions? The conference is comprised of a broad selection of papers and methodologies related to the theme of “human nature,” including, theoretical examinations of dehumanization in warfare and the American prison system; theological treatments of death and sexuality; the relevance of Confucian perspectives of human nature for moral philosophy; social scientific reflections on methodology, sexuality, and interreligious relations; and ecological approaches to human nature.